Doing anything nice this weekend? As the evenings get lighter and the days get longer, what better way to celebrate the return of springtime than by coming to watch Central City Rollergirls in a huge double header filled with roller derby excitement!? 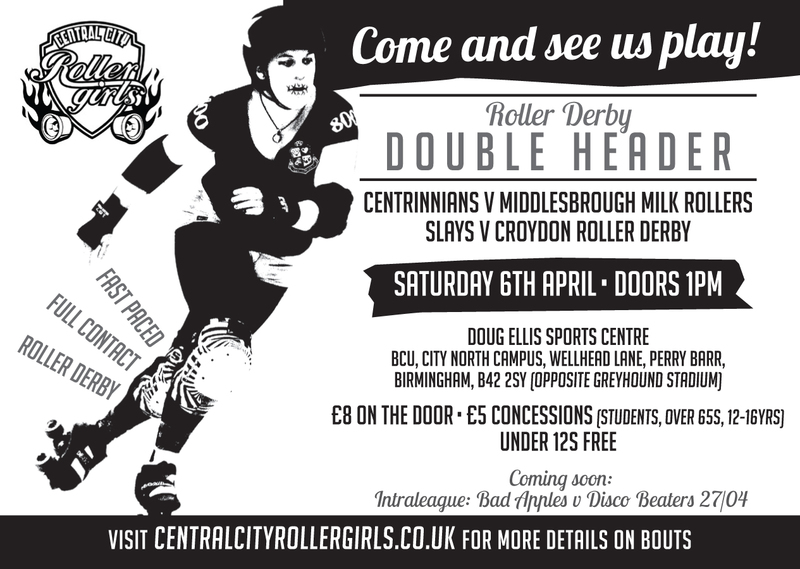 On 6th April 2013 Central City Rollergirls (CCR) Slay Belles – currently ranked 51st* in Europe – square up to Croydon Roller Derby (CRD), followed by CCR’s Centrinnians – currently ranked 7th* in Europe – taking on Middlesbrough Milk Rollers (MMR) in what are sure to be two fast paced and exciting bouts. CCR have learned a lot from high profile bouts such as 2012’s Track Queens European Championships in Berlin, and will be bringing new strategies and enthusiasm to the track for both bouts. However, neither of the visiting teams will be going down without a fight – CRD began in 2009 and are rising fast, playing regular fixtures. They won last year’s Eastbourne extreme tournament and are currently ranked 42nd* in Europe so they are definitely ones to watch. MMR were the first league in the North East, and one of the first leagues in the UK. They have made a big impact in UK derby over the past year, did extremely well at last year’s great Yorkshire showdown,and are currently ranked 21st* in Europe. Both visiting teams will be looking forward to showing what they’re made of when they hit Birmingham! April 6th will be the first time CCR and CRD have met on track and they have everything to play for. CCR and MMR have played together in the past but both teams have evolved since then so all bets are off. Both bouts are likely to be fast, furious events, with all the teams involved throwing everything in to win. Make sure you’re there to witness it!